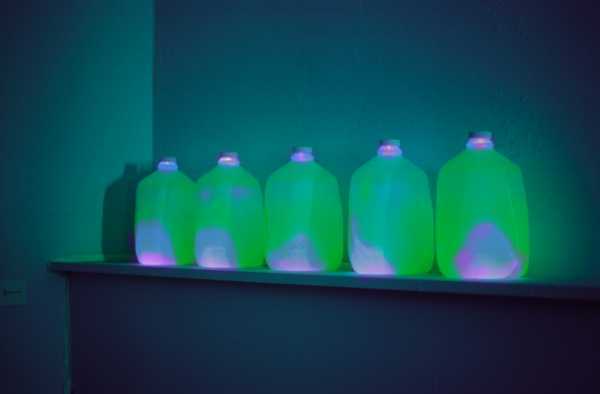 Using ultraviolet light emitting diodes and fluorescent paint, five ordinary plastic milk jugs emit a sinister and mysterious glow. To our eyes, a subtle fluorescent dayglo effect occurs; soft yellow throughout the jug, with a faint purple tinge near the cap. Unfortunately, this ultraviolet light does not document well on film or digital cameras. This piece was inspired by the near radioactive appearance of the residue in a milk jug. The persistent yet futile "terror alert" states since September 11 are somewhat related.